Several members of the group converged on Tutbury Village Hall for the Supermeet, and I include below a few of the photos I took. 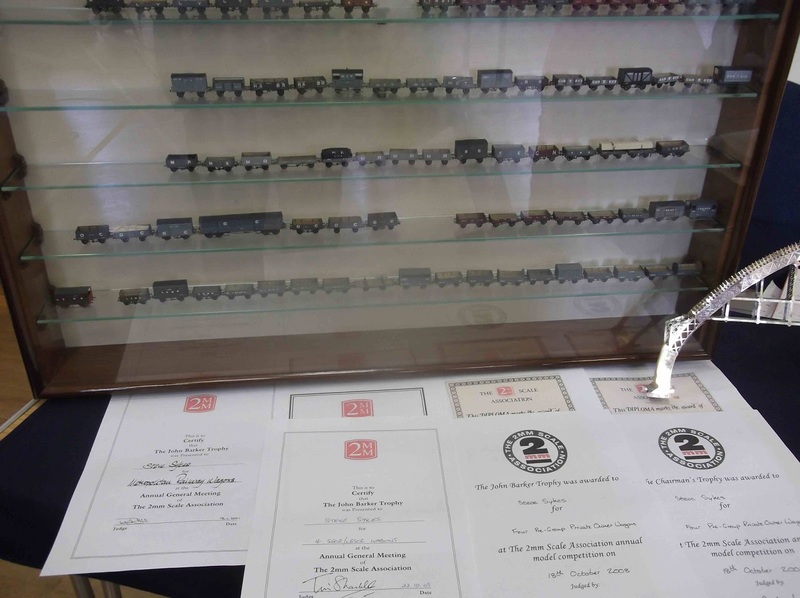 Some of the wagons built by the late Steve Sykes, together with prizes that they won at 2FS AGM competitions. 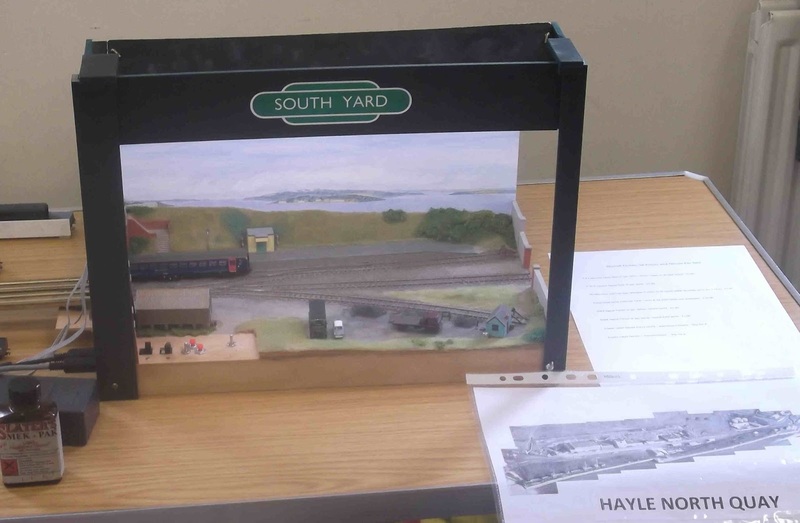 Laurie Adams' layout "Yeovil Town"
The shunting tractor on Yeovil Town, which tested the driving skills of several spectators. 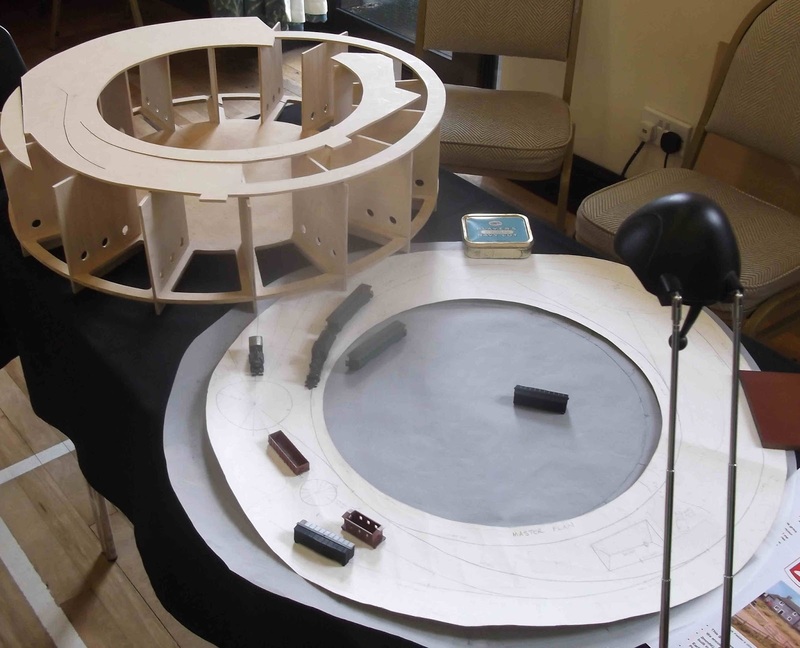 An updated/extended version of Mark Fielder's "British Oak" layout, which features in the Beginners Guide. 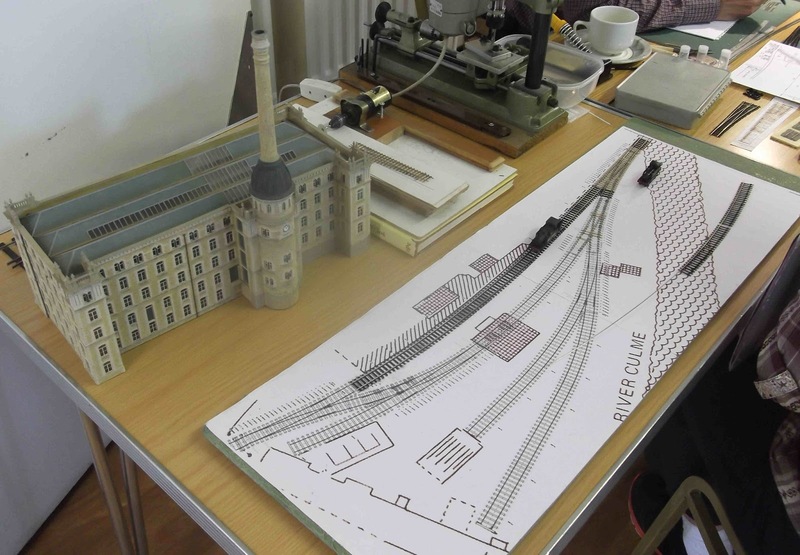 This version, by Richard Caunt, incorporates working hopper systems which deposit coal into the barge (and coal dust into the neighbourhood!). 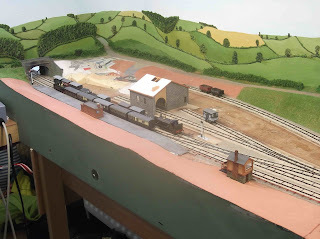 Early stage of a narrow gauge layout by Phil Copleston. 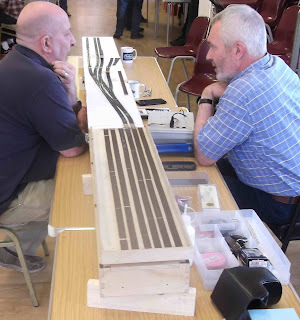 Discussion of the "Minories" layout, which Mick Simpson and Alan Whitehead almost finished over the weekend at Railex. "Colwyn Bay Goods" from Bryn Jones. Various works-in-progress on Keith Armes' table. There were at least half a dozen other displays that aren't included in the above photos. 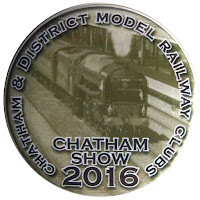 This month's meeting coincided with the two day Chatham Show to which Lightermans Yard was invited, attendance at the show replacing our normal monthly proceedings. Following the successful set-up by the Friday crew (Alan, Keith, Alan B and Pete K), and leaving the layout in full running order, a mysterious 'short' first thing on Saturday morning found Keith under the layout and eventually replacing the cause, a failed point motor! 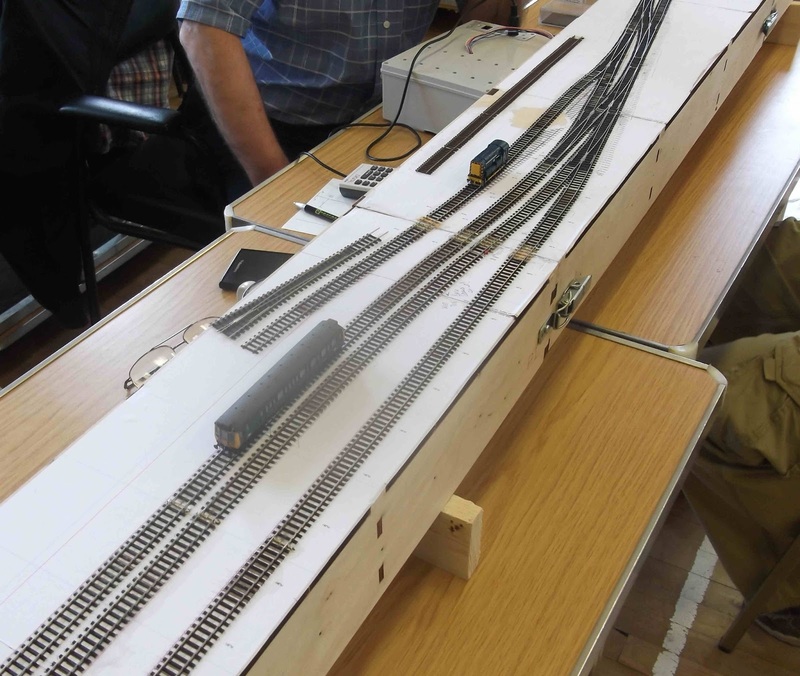 Also discovered was that the two DCC controllers would not allow each other to operate simultaneously, allowing only a single locomotive to be 'driven' at a time. Mild frustration! 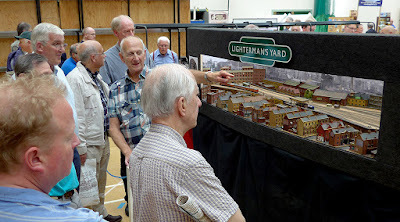 However, our frustrations appeared not to be transferred to the viewing public who were generally unaware of our problems and were very complimentary about Lightermans Yard. Of particular interest for all ages being the level of detail in the buildings and scenics, despite the two new additions, the main warehouse and the low relief buildings at the left end of the layout still being 'work in progress'. Fortunately for our group, Pete Townsend was able to attend (and share the very positive comments about the buildings), his impending westward move having been delayed. 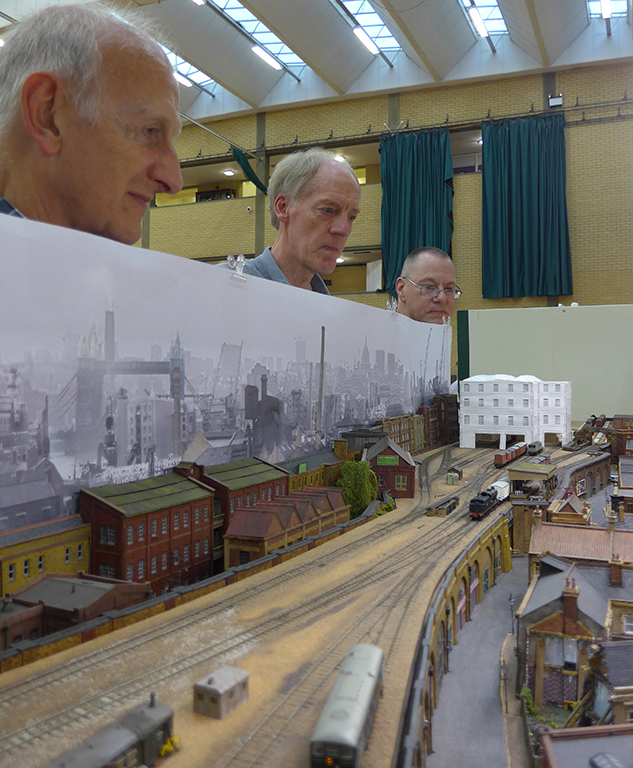 The Saturday crew; Pete K, Alan S, Keith, Gordon and Richard - Pete Townsend and Alan Brazier were supporting public! David Walley was otherwise engaged operating the Wealden Group's 2mm layout, Llangerisech which was also in the show, although in the other hall and not close enough for us to share the occasion. 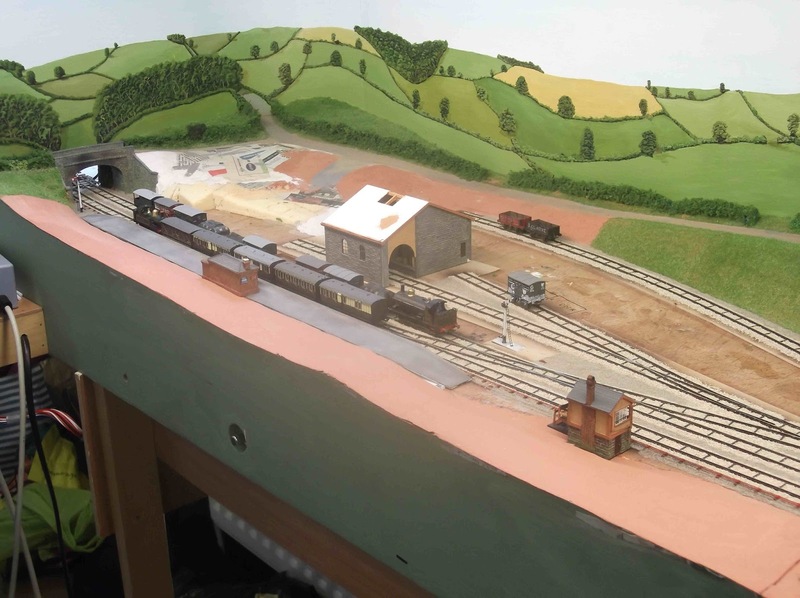 The partially finished curved warehouse at the left end of the layout was positioned, it fitted much to Richard's relief. Minus windows, but painted, it now requires a few 'tweeks' and some weathering to complete the scene (left). 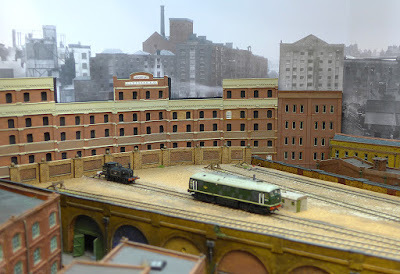 On reflection, and with the mock-up of the railway warehouse in place at the other end of the layout, it was generally agreed with Alan S's intention to reduce the overall height of this building. Operators sharing the running on one controller (right). On Sunday, with both controllers working, a short piece of rail became detached and required an emergency 'weld' to re-establish contact. 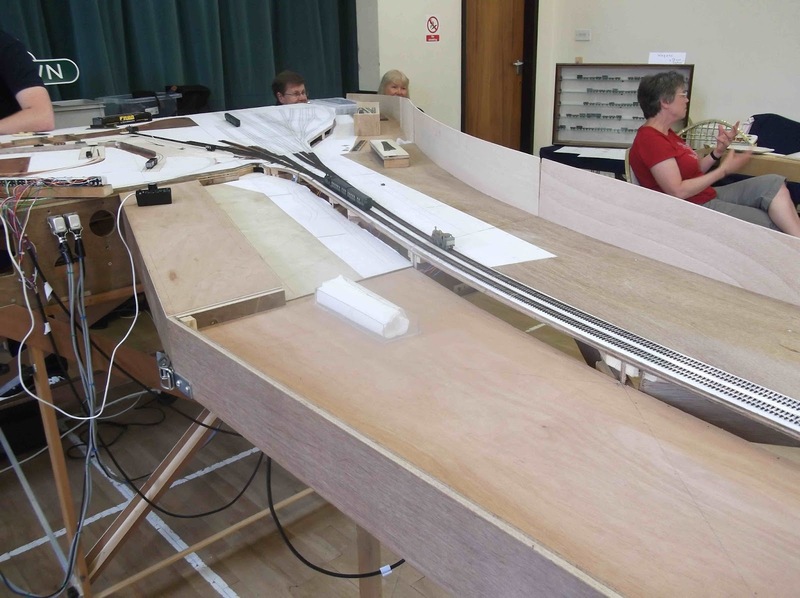 Also discovered was the required controller settings for double operating, found by Pete K deep in the manual. 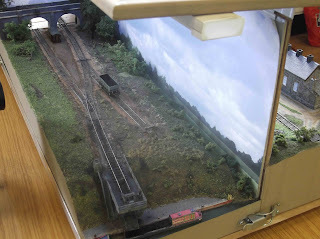 We had two trains running for most of the day until a short reduced us to single working again. Sunday crew; Pete K, Alan S, Keith with Richard and David S joining after the opening. We were delighted by the number of enquiries from exhibition organisers or their representatives to show at various exhibitions next year or the year after, we could be on the road several times in the coming months! It took only 45 minutes to disassemble and pack the layout away in its traveling cases, and load them into vehicles for their homeward journey. Very pleasing to all concerned. Although a little disappointed by the fairly light attendance on both days, this was a successful outing. As Pete King said on behalf of the group, thanks to Pete T for kicking the old girl into life. The large majority of the nice comments were about his scenery. So thanks again Pete for your legacy.